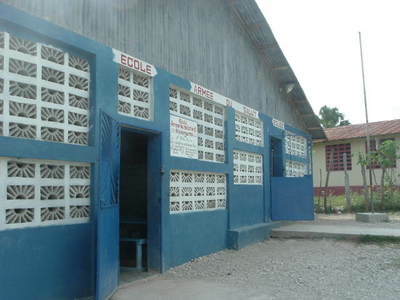 Felix and I have just gotten back from a week at a Salvation Army continuing education seminar in PAP at an OMS guest house. The wireless internet connection wasn’t very stable and when it was connected it took a LONG time to do even simple things and I would run out of time between meetings. I was able to get the Easter photos uploaded but not organized. 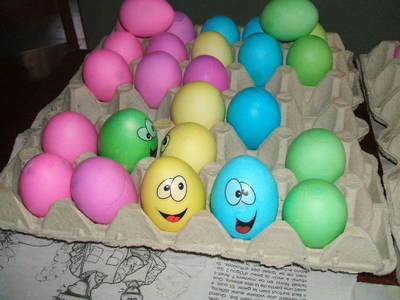 Matthew and I colored our traditional Easter eggs. This year we did 150 of them: 45 for Bethany Children’s Home, 25 for the clinic patients, 20 for our TB patients, 50 for Bainet corps and 10 for people Matthew chose (Mommy, Daddy, Mayotte, Daniella, Madam Ticoq, etc.). The lady at THQ who sends us our books and magazines agreed to send us the egg dye kits. They were really fancy this year; glitter eggs done with glue and foil paper, tie dye, and eye stickers. 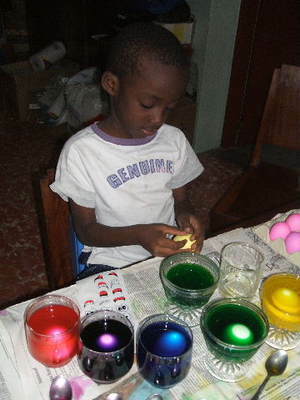 While I did the glue and foil, Matthew got good at dipping the eggs in the dye. It went fairly quickly, with Mayotte cooking the eggs and the two of us decorating. 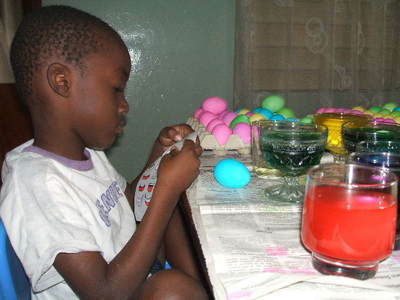 This is NOT a tradition here in Haiti so they are received with amazement and joy. 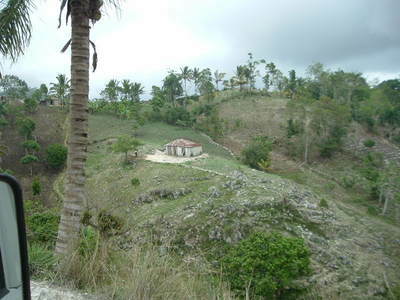 Then the three of us plus Mayotte and her daughter went to Bainet (on the southern coast west of Jacmel) for Easter. We were supposed to go mid-day on Saturday in order to get there in the daytime. That didn’t work out at all with all we needed to finish up at the house so we left a little after 6 pm. We thought that it was a 3 – 31/2 hour drive. Wrong again! 4 1/2 hours later – 92 miles (nearly 11 pm) we pulled into the SA property. Kind of interesting…it was 23 miles (1 hour) from the juncture of the two main highways (Carrefour Dufort) to where we turned off onto the rocky road (Carrefour LaVallee -just outside of Jacmel) and another 23 miles (1:50 hours) from there to the SA in Bainet. The officer (pastor) had a late supper ready for us (goat head boullion…not my favorite by any means) and then we were off to bed…the 3 of us in a double bed. 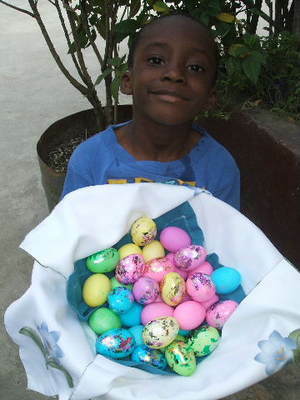 Felix preached the next morning and after the service we gave out the Easter eggs Matthew and I had colored on Sat. morning (another reason that we didn’t leave at noon). We had also brought cookies and soda for everyone. It is a smaller congregation (about 45 people) and everyone was very appreciative of the little snack. We left around 3 pm and made it back to FDN by 7:30pm. 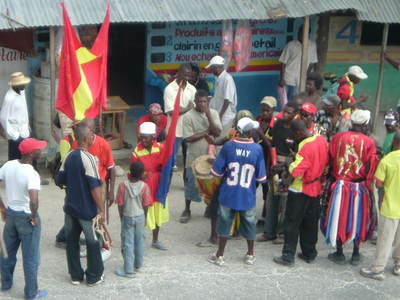 We did encounter a lot of the RahRah goups (the voodoo “praise & worship teams” that play their home-made musical instruments, drink their home-made liquor and dance along the road especially during Holy Week) on Sat as well as Sunday. I counted 14 groups between Bainet and FDN. Most were fairly orderly but one near Grand Goave blocked the road entirely so we just had to sit there for about 10 minutes while they moved the beat of their own drums. Then Monday morning we handled what business we needed to do and headed back to PAP around noon for the Cont.Ed seminar. 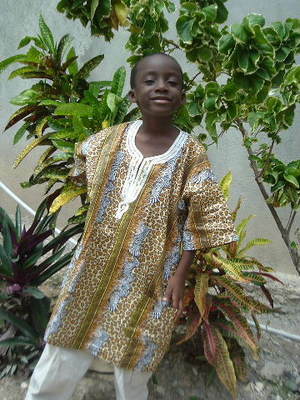 I was really ready for the time of rest, fellowship, good meals and good instruction. The two instructors were from the SFOT in NY. It was on leadership and time management and it was all we could do not to be poking each other in the ribs for points we wanted the other to hear! Felix went into PAP today while I stayed at Ormiso working on the clinic payroll. I rewarded myself for the full day of number crunching by taking a swim. It was a good week but I’m glad to be home. Matthew was asleep when we got in at 9pm so I’m looking forward to my hugs tomorrow. Thank you as always for sharing. Matthew made some wonderful Easter eggs. That is wonderful that you were able to bless others with them. It is amazing how different each country is with Holiday customs. I pray that God will richly bless you this week. Rest in His almighty arms and He shall renew your stength. I love reading your posts. SHALOM! Awww… I remember making the eggs three years ago. I decorated a whole dozen this year with three of the kids on my hall. It’s good to hear from you. Tell Mayot and Giselle I say bonswa. Love the pictures. RYC – We hit a dear once – that was scary. But we almost hit a cow in Wichita. But a Donkey is better.